It has been 10 years since I received this scholarship. 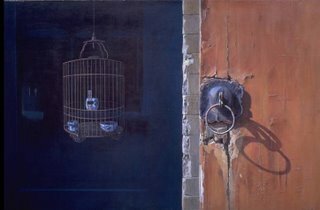 I spent 3 months in China, and it proved to a seminal point in my art career in terms of subject matter, materials and methods used. When I decided to return to college in 1995 to study a post Graduate Certificate in Secondary Education, I had already been painting, and exhibiting, as well as working full time for eight years. It was during this period while at College, that I applied for a number of scholarships, one of which, I was fortunate enough to win, the Alastair Salvesen Travel scholarship. 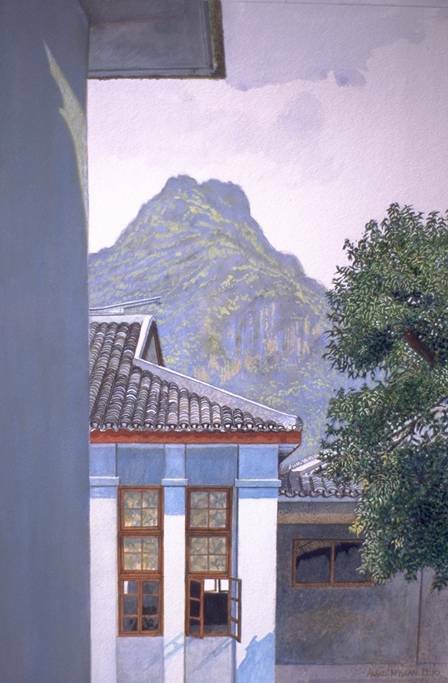 I chose to visit China, and spent 3 months traveling and painting, almost as soon as I had graduated that June in 1996. I traveled from Beijing to Xian, Chongching to Nanjing, down the Yangtze River, and then on to Guilin and Yangshuo in the South of China. As part of winning the scholarship, it was necessary for me to produce a number of paintings documenting my experiences. These were then to be exhibited in the Royal Scottish Academy, Edinburgh, on my return to Scotland. In the end I produced a total of 51 pieces. I worked mainly from life and began to establish a rapport with watercolour, a medium I hadnt really explored properly up until that point. Since the material was light and convenient to carry, I found I could climb hills, produce a painting at the top, return to the hotel and finish the work from memory. This versatility gave me confidence to really start enjoying watercolour and I began to experiment with it. This was the turning point where I established my interest and association with the medium of watercolour. The year before, I had been elected a member of the royal Scottish Society in Painters in Watercolours, but it was mainly with my acrylic work. I really didnt start using the medium in earnest until the China trip in 96. For the past few years I have concentrated on watercolour and I have discovered and investigated a number of techniques which can describe a multitude of surfaces, (which I think are particularly unique). I owe it all to winning the Scholarship because it forced me to confront a medium I had considered at one point too difficult to even contemplate trying. The reason for bringing up the Salvesen Award is to mention that my friend and colleague at Dundee College, David Martin is the most recent recipient and you can follow his travels through the middle East (brave man).